Living with cancer is not an easy feat for anyone. It is even harder when there is no treatment either available or affordable for the patient. In Bangladesh thousands of people are afflicted by this deadly disease and the majority of them are unable to get proper treatment. 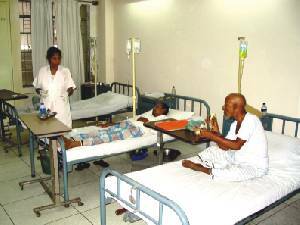 Until recently most of our hospitals were not able to offer sufficient and adequate doctors, facilities or equipment. The Ahsania Mission has taken a vow to change this. In 2001 it established a Cancer Detection Centre, a forerunner for the Ahsania Mission Cancer Hospital that it is building in Uttara. The idea is simple -- provide international standard treatment for cancer patients all over Bangladesh. Patients will be charged according to how much they can afford and for patients who are unable to pay, one-fourth of the facilities and treatment will be free of cost. In order to be able to provide this unique service, however, the Ahsania Mission has to raise a total sum of Tk. 150 crores. They are now appealing not only to corporations and companies, but also individuals and communities for their help in raising enough money to combat cancer in Bangladesh.